Forum Index > Historical Arms Talk > What Do I have? Posted: Wed 08 Jan, 2014 11:19 am Post subject: What Do I have? Posted: Wed 08 Jan, 2014 4:11 pm Post subject: Re: What Do I have? 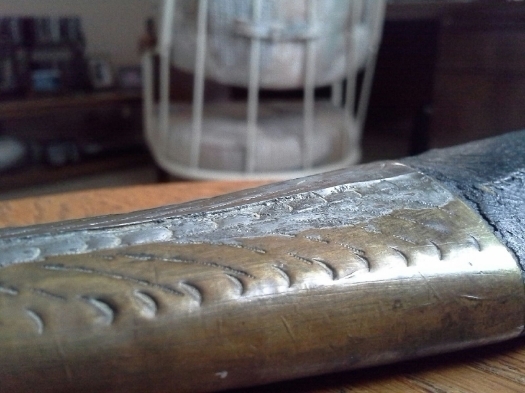 I believe the correct term is "bebut" (curved kindjal), most probably Russian. I too believe it's a kindjal. 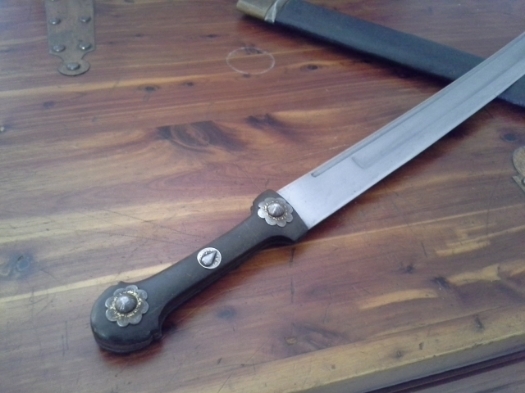 I haven't seem one with such a blade but i like it very much, great find. Interesting, thanks. I can't find much info on these...one site said they were carried by Cossacks? If I was to guess, I'd say 19th to perhaps early 20th century? What do you know about yours David, and how did you come across it? Net search for Quadara/Quaddara will give you info re this type of weapon. Hope this is of help. Quaddara (with variation in the spelling) is the Persian/Iranian name. Bebut is, AFAIK, the Azeri name. They're quite common in Azerbaijan (or, at least, used to be). 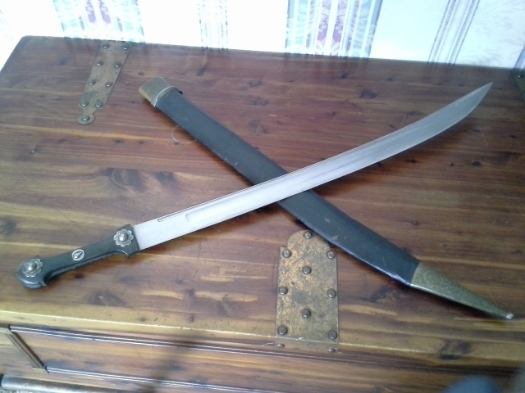 In Russian, they are usually called kindjal (which is also used for the straight double-edged blades). So, perhaps, if you want to know the "proper name", it is necessary to know the region of origin. There might be naming differences for the curved double-edged blades and the curved single-edged blades (single-edged, neglecting a short back edge). The Russian military ones are double-edged (unless I'm confused by bad replicas), which are often called "bebut" to distinguish them from Russian military straight kindjals. Go with what Manoucher says as far as names. He really is the expert. I will try to take some photos of mine to post, work depending. I cannot tell you much about mine. Unlike the bulk of my collection that was bought in the middle east this one was bought at a gun show in Fayetteville North Carolina. Timo, thanks for the links. I'll check'em out when I'm off work. @ David, I look forward to seeing pics of yours. The other day my Father-in-law asked me to bring the piece to his house so he could look it over. He said he new some key things to look for to see if it is authentic. When I handed it to him, he immediately looked at the back of the scabbard's chape. After a few seconds, he said, "reproduction." From what I can see on the photographs, NO. I agree with Norman, soldering has existed since at least 3000 BC and would have been available to an inhabitant of the Caucasus mountains in the 18th-20th centuries. One correction I might make in terms of its name, a better pronunciation/transliteration of the Russian term is "kinzhal" as it is spelled кинжал in Russian and the ж character is pronounced "zh." According to my girlfriend, who is a native Russian speaker, the word means any dagger not just ones from the Caucasus. If that's a reproduction it's the kind I'd like to own. Good news indeed, thank you gentlemen! Soldering is an old technology, perhaps 6000 years old already. So soldering (and brazing) don't mean "modern". (The particular solder alloy might.) Also, the reproductions I've seen haven't had solder seams like that. It's probably a repair (and could be a modern repair). 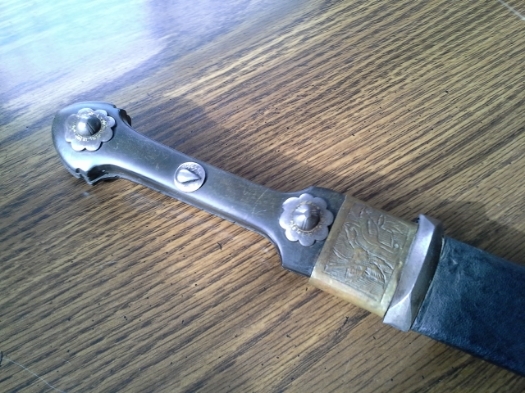 Scabbards get recovered, replaced, etc., and sometimes the old scabbard fittings suffer in the process. The suspension ring mount is a different metal from the rest of the scabbard mounts? Could be mix-and-match scabbard parts. Russian Imperial issue Model of 1907 issued to artillery and machine gun crews. One of the last attempts to use swords as combat weapons. When the Bolsheviks took over they discontinued it as military issue. 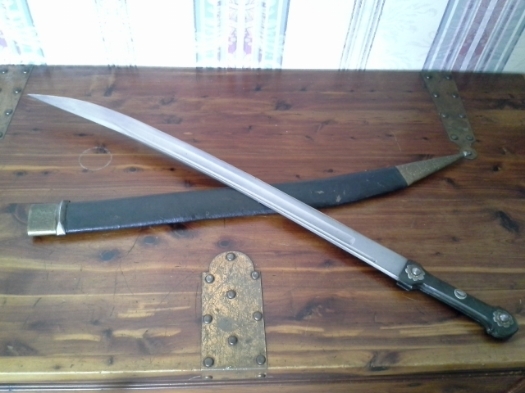 Originals have proof marks on blade and scabbard.